Share "The Importance of Extra Hay During Winter Months"
It is true that during the winter months riding your horse can become a scarce occasion. This means that your horse’s diet must also change. Since the horse is not as active during these cold months, it requires fewer calories. It was once believed that feeding your horse more corn during these inactive months is better for keeping the horse warm, but now science has discovered hay is better at converting calories into heat and also promotes good gastrointestinal health as well as helps to preserve the horse’s weight. The horse’s diet should be at least 50% if not all hay, supplemented with feed. Since the horse should be eating 1-2% of its bodyweight daily, if the average horse is about 1100lbs, it should be consuming from 11-22lbs of food a day, most of which should be hay. You should not wait until the first frost to decide what you will feed your horse during the winter months. It is good to have the horse’s diet known well in advance. It would also be smart to acclimate your horse to its new diet by adjusting its feed slowly. Make sure that the hay is soft and void of dust or mold. This is usually found in round bales of hay, and while it may be cheaper, it is better to pay the extra cash rather than risking a respiratory infection or other disease. Also make sure that the hay stays dry by protecting it with a waterproof tarp and keeping it elevated from ground level. It would be best if the hay were not kept over the horse’s stall. While this might be a great place to preserve the hay’s quality, dust particles may rain down on the horse and can cause heaves. 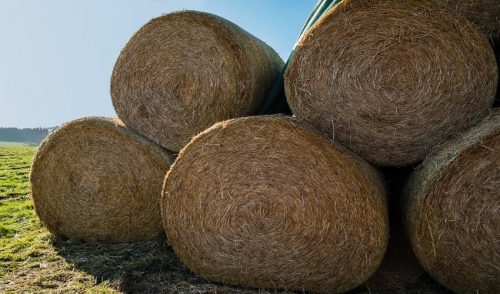 You should also know the nutritional value of your hay; it is not the same for each stock. An easy way to get this checked is by bringing it to your local county extension office. The test may take several weeks so in the meantime you can calculate the nutritional requirements for your horse. This varies with age, size, workload, etc. You can find a table of this information online or at your local feed store. Remember that the energy and warmth that the horse gets from hay is not an excuse to neglect riding your horse. Proper exercise is always a crucial factor.